University of Montana researchers have made another discovery at the cellular level to help understand the basic processes of all life on our planet - this time within the unusual bacteria that has lived inside cicada insects since dinosaurs roamed Earth. During the past 70 million years, the bacteria underwent extreme adaptations to live within the insects' bodies, losing between an estimated 95 to 97 percent of their genes and resulting in some of the smallest genomes known to any organisms. In the process, they lost the ability to live anywhere outside of cicadas. 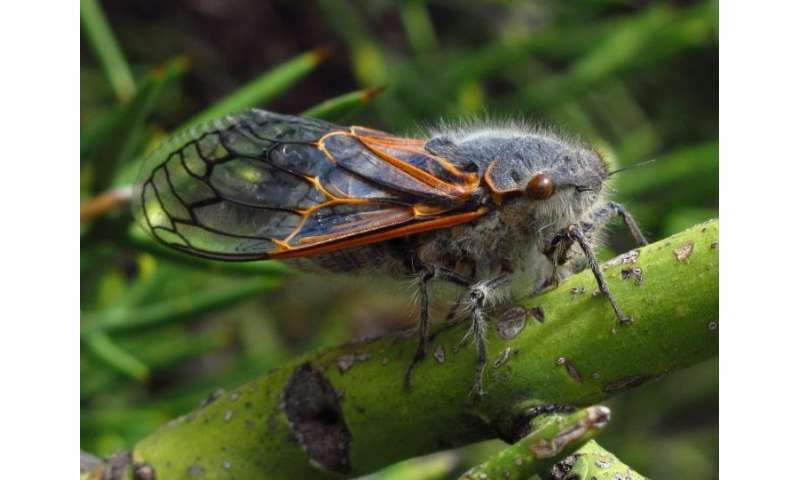 "Cicada symbiotic complexes are very different from any other known organism," said Matt Campbell, a UM graduate student who studies cicadas in UM biology Associate Professor John McCutcheon's lab, based in the Division of Biological Sciences. Many insects live in very close associations with beneficial, or "symbiotic," bacteria. These bacterial symbioses are critically important for insects that consume only one type of food that is missing some essential nutrients. Examples include blood-feeding lice as well as insects that feed on plant sap - aphids, leafhoppers and cicadas. The UM research has shown that cicadas' symbiotic bacteria produce amino acids and vitamins that their insect hosts require to grow and reproduce.During three field seasons studying a South American cicada, UM postdoctoral researcher Piotr Lukasik found many of the species' single symbiotic bacterium evolved into complexes of several different types of bacterium in the same cicada. "Through that process, individual bacteria have lost many genes and now depend on each other because every type contains unique, essential genes," Lukasik said. "The different types must all work together to provide the amino acids and vitamins their cicada host requires." A different species of cicada, located in the eastern U.S., contains dozens of small, rapidly evolving types of bacterium. Individual types typically contain few recognizable genes and are distributed among different cellular compartments within a cicada in a way that is not fully understood. "Cicadas host symbiotic complexes rather than a single, well-behaved bacteria, which could be a challenge for the species," Lukasik said. "After all, when you need a meal - whether it is a vitamin required by a cicada or a pizza craved by a hungry student - it's easier to obtain it from a single source rather than cobbling it together from several different sources." The researchers believe this evolution of bacterium happened by chance, and despite not being helpful to the cicada, the microscopic creatures must stay for the long haul because the cicada now requires them to survive. "Indeed, the cicadas with the longest life cycles are also those with the craziest bacterial symbionts," Lukasik said. The research recently was published in the Current Biology article "Idiosyncratic Genome Degradation in a Bacterial Endosymbiont of Periodical Cicadas," as well as in the study "Multiple Origins of Interdependent Endosymbiotic Complexes in a Genus of Cicadas" in the latest issue of Proceedings of the National Academy of Sciences of the United States of America. Try Intestinal Exchanges if feasible !